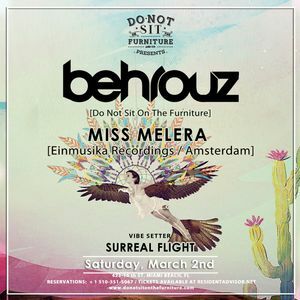 Saturday, March 2nd, Do Not Sit On The Furniture presents ▲ BEHROUZ [Do Not Sit On The Furniture] ▲ Miss Melera [Colourizon / Amsterdam] Vibe Setter: Surreal Flight xxxxxxxxxxxxxxxxxx BEHROUZ Very few artists need a proper introduction as their name alone speaks for itself and connotes veteran status. Behrouz is easily recognized both on the Burning Man playa where he has held a highly coveted residency on the Robot Heart bus and is well known all over the world having been a household name for those who truly know what's up for well over two decades now. An artist who has seen nearly every inch of the globe as he has shared his music with millions from continent to continent, his name and reputation proceeds him. A DJ's DJ in every sense of the word, Behrouz is a favorite amongst many of the most talented artists and producers on the planet. He is a true story teller and a magician behind the decks evoking powerful emotions through his sound. In addition, BEHROUZ is not only the owner & curator of Do Not Sit On The Furniture but holds residencies in San Francisco, DC and everywhere in between. He is most famous for touching the hearts of listeners and leaving their spines tingling with his emotive selections of deep house all the way ranging to romantic techno, as he likes to call it! MISS MELERA For the past decade, the Amsterdam based Miss Melera has been absorbing the essence behind traditional genres such as deep, tech house and techno and twisting them into a melodic confection that is both fresh, timeless and completely her own. In the past years she has played high profile dates in Europe, Asia, South and North America. In 2012 she has started her monthly radio show and event called ‘COLOURIZON’. Her show is broadcast on several radio stations worldwide and increasingly popular on her Soundcloud profile. As COLOURIZON developed quickly into a global phenomenon, Miss Melera was invited to play for her fans all over the world. The success of the radio broadcast turned into a successful touring career, with invites to perform in venues like D-Edge (São Paulo, Brazil), Warung (Itajaí, Brazil), Fusion Festival (Lärz, Germany), Nest (Toronto, Canada), Womb (Tokyo, Japan), The Pickle Factory (London, UK), Le Bikini (Toulouse, France), Rote Fabrik (Zurich, Switzerland), Harry Klein (Munich, Germany), Niceto Club (Buenos Aires, Argentina), KaterBlau (Berlin, Germany), Baum (Bogota, Colombia) and of course her Dutch hometown Amsterdam where she is hosting a COLOURIZON residency at De Marktkantine. Her fast-growing fanbase is embracing her latest release, ‘Nirvana’ on the English label Polymath which follows after a remix on Traum and her ‘Magenta’ EP on Chapter 24 Records including remixes by Dave Seaman and Jonas Saalbach. With releases on Parquet Recordings, Einmusika Recordings, a collaboration with Eelke Kleijn, Olivier Weiter & Arjuna Schiks on the WEITER label, Chapter 24 Records, Traum, Polymath and her upcoming tour schedule, Miss Melera will give global audience a chance to discover her vision of electronic music.